The Cosmetic Industry is heavily saturated now and it is crucial for brands to stand out from their competitors and attract sales. One way to captivate the potential buyers and gain competitive advantage is having a well-managed Cosmetic Display Counter. In this case, we’re using NARS Cosmetic’s successful POP Display as an example. They’ve made use of Interactive Technology Marketing to amp up their Cosmetic Display Counter. What is Interactive Technology Marketing? Interactive Marketing is the individualisation of marketing messages based on consumers’ actions. This will be able to provide highly targeted content to each customer to better meet their needs and wants. Merchandisers can make use of the advanced technology today to adjust marketing contents to suit customers’ tastes and preferences. 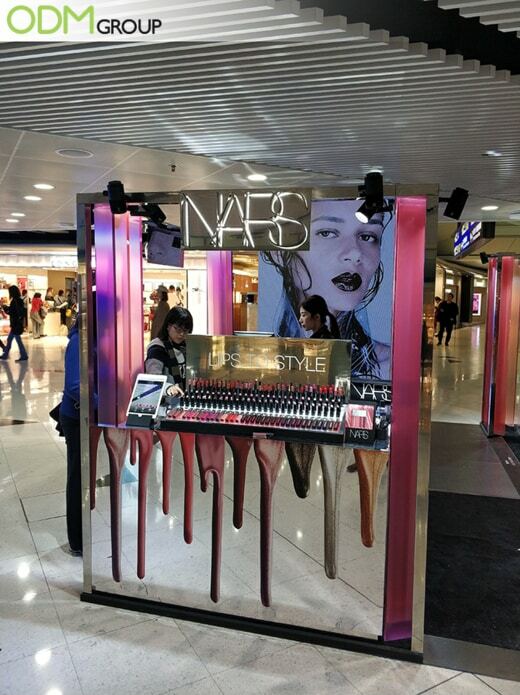 NARS Cosmetics‘ Display Counter has a modern and futuristic look that is extremely distinct. This will intrigue customers to walk towards the store and see what they have to offer. It allows them to stand out from their competitors and have a competitive advantage over other others. The Cosmetic Display Counter has successfully grasp the attention of makeup lovers. 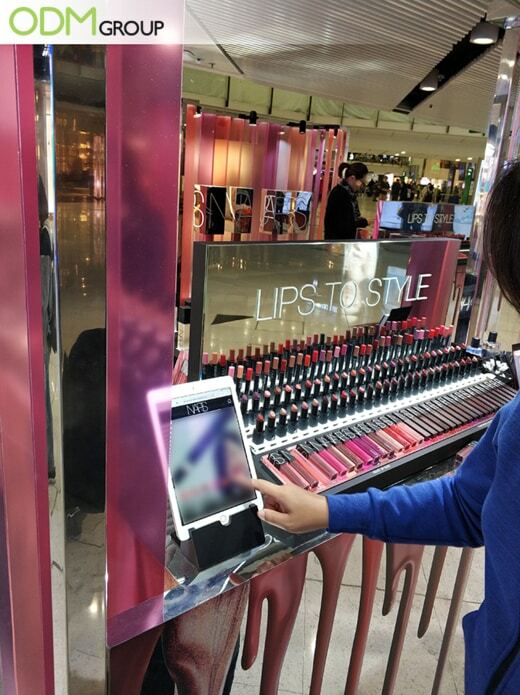 Besides its bright aesthetics that showcases their lipsticks perfectly, they also have an interactive iPad to engage the attention of potential buyers. Many end up not buying lipsticks as they rather not use the testers due to fear of contamination. This Interactive iPad solves all these concerns, giving consumers a pleasant shopping experience. The iPad provided at the counter allows consumers to try on lip shades virtually instead of using the actual testers. This might appeal to those who do not want to use the samples provided. This concept will also fascinate those who already have lipstick on and do not wish to remove their lipsticks to try on a lipstick shade. The convenience it provides could be a good selling point. On top of that, the large digital advertising boards at the side present models with NARS’ lipsticks on so consumers could learn more about the product. Such as if the product has a glossy / matte finish, and a bright / muted colour. It is also practical for merchandisers to have a Digital POS Display as they are able to easily change the contents without having to remove the entire display. This will allow them to be more cost-efficient in the long-run. Furthermore, merchandisers can also show multiple contents at once because the digital display can show a few contents in intervals. A touchscreen feature can be added to the digital display to better engage consumers. This will build a rapport with customers, as well as a positive experience. The large digital display can also highlight the current beauty promotions or customer loyalty programmes that NARS is offering to attract consumers that are interested in potential savings. A survey can also be given to customers after they have virtually tried on their lipstick shades on the iPad. This way, NARS can have an insight into customers’ demographics and create a more meaningful experience for them. Getting customer information such as phone numbers or email addresses can give NARS an option to send marketing messages to them. Providing customers with personalised contents based on their reactions and response is a great way to grow your market reach. This makes marketing more effective and efficient towards targeted customer base. It also also reduces risk and boosts sales because it focuses on customers’s actions and prospects. This will ensure higher customer satisfaction, thus a higher repeat purchase rate. Keen on having your very own Cosmetic Display Counter to help you achieve the benefits mentioned above? Free free to contact ODM today. Our specialised team will be able to assist you every step of the way, so that the process is simple and pleasant. Check out our other blogs for examples of In-Store Displays! Why are some in-store displays so successful? Here are the reasons listed and explain. Check out this blog to find out how to spice up your very own promotional in-store displays! Interesting Promotional In-Store Displays You Can’t Miss!! Here is why the fantastic In-Store display fabricated by Nestle for one of our personal favourites. Click here to find out how well-managed in-store displays can benefit you! This one by Jelly & Gelato’s ice cream cart display is a great example of an effective cosmetic pos display because the colors and all the designs suit their brand name. It also appeals to their target market.